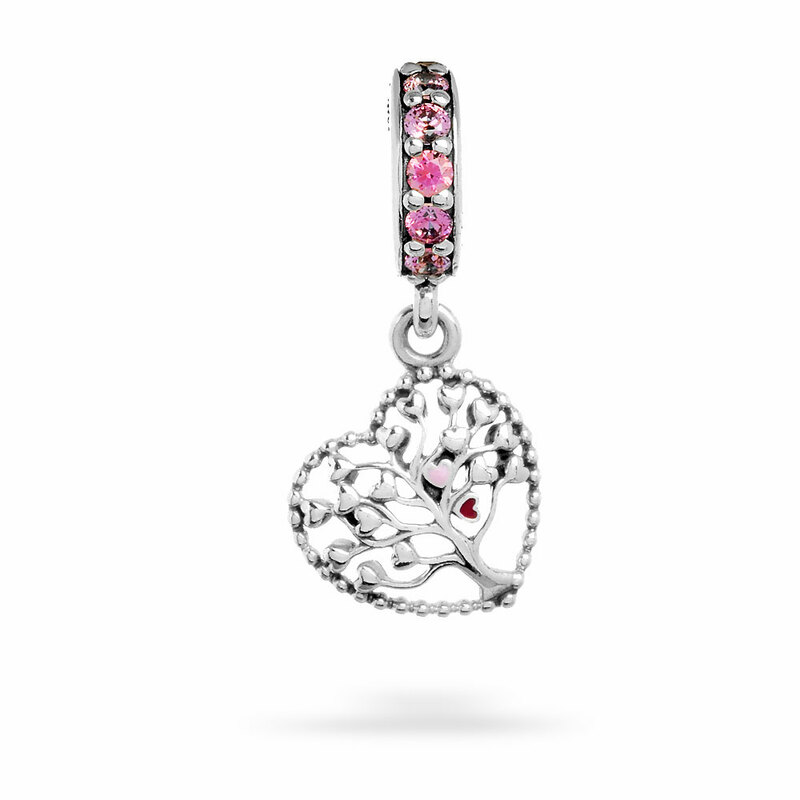 Depicting a stunning tree of love with heart-shaped leaves - two painted in pink and red enamel, this intricate sterling silver hanging charm symbolises friendship, love and loyalty. Available online or in-store.This item is a single charm only. Bracelets sold seperately. Styling images may show this charm on a bracelet as styling inspiration. Tree of Love Hanging Charm is rated 4.8 out of 5 by 25. Rated 5 out of 5 by Vask from Serenity! Just received my tree of life dangling charm and it is gorgeous. Very peaceful when looked upon. Rated 5 out of 5 by PattyG from Birthday Gift Just bought this charm with a mesh bracelet for my sister-in-law’s 60th. I know she will love it as much as I do. Very happy with the detail on this charm and a little color with the CZ’s. Rated 5 out of 5 by MichelleK from Perfect for my pink collection! This tree is so pretty. I love the cz pink crystals stand out while the tree has very detailed painted flowers in pink and red (the rest is silver). I have a pink section and this fits in perfectly! Rated 5 out of 5 by Grannysmith02 from Love dangle charms! This charm is so detailed and delicate, it is beautiful! Early Valentines Day present from my husband! Rated 5 out of 5 by TR69 from I'm sure she'll love it! nice detail to the piece. the quality you expect at a reasonable cost. I haven't given it to my wife yet; as it's one of her Valentine's Day gifts, but I'm sure she's gonna love it! Rated 5 out of 5 by GigiHon from Excellent piece! I recently purchased the pieces and, I am delighted with them.